Lope National Park, one of Gabon's 13 game reserves and national parks. Gabon, a country at the Equator in West-Central Africa bordering the Atlantic Ocean in west is bordered by Equatorial Guinea, Cameroon, and the Republic of the Congo. With an area of 267,668 km², the country is somewhat larger than the United Kingdom, or slightly smaller than the U.S. state of Colorado. 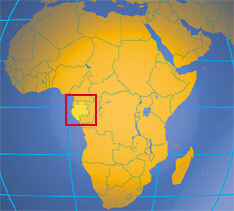 Gabon has a population of estimated 1.5 million people. Capital and largest city is Libreville. Spoken languages are French (official) and a variety of Bantu languages. Because of its oil and mineral reserves and a relatively small population, Gabon is one of Africa's wealthier nations, which is able to protect and preserve its pristine rain forests with a rich biodiversity. More than 10% of Gabon's area is protected parkland, there are 13 National Parks in the country, among them the forested coastal terrain of the Loango National Park, 'Africa's Last Eden' shelters a diversity of wildlife from gorillas and hippos to whales. Lopé National Park consists of mostly rainforest, but in in the north the park contains the last remnants of grass savannas. Akanda Park is known for its mangroves and tidal beaches. Highest mountain in Gabon is Mont Iboundji with 1,575 m.
Only two autocratic presidents have ruled Gabon since independence from France in 1960. Gabon's former President, El Hadj Omar BONGO Ondimba - one of the longest-serving heads of state in the world - had dominated Gabon's political scene for four decades (1967-2009). Following President BONGO's death in 2009, new elections brought Ali BONGO Ondimba, son of the former president, to power. Other Cities: Port-Gentil (136,000), Masuku-Franceville (110,000), Lambaréné (25,000), Mouila, Tchibanga, Makokou, Koulamoutou, Port-Gentil, Oyem. Type: Republic; multiparty presidential regime. Independence: 17 August 1960 (from France). Terrain: Narrow coastal plain; hilly and heavily forested interior (about 80% forested); some savanna regions in east and south. and two dry seasons (May - September main dry season). Ethnic groups: Over 40 ethnic groups: Fang (34%), Bapounou (22%), M'Bete (14%), Bandjabi (11%), Bakota (6%), and Myene (5%). Agriculture products: Cocoa, coffee, sugar, palm oil, rubber; cattle; okoume (a tropical softwood); fish. Industries: Petroleum extraction and refining; manganese, and gold mining; chemicals; ship repair; food and beverage; textile. The official site of the Republic of Gabon. Official website of the senate. Official website of the National Assembly (in French). The French Embassy at Gabon. Map of Gabon showing the country's administrative regions. Searchable map and satellite view of Gabon. Searchable map and satellite view of Gabon's capital city. Radio Africaine, a pan-African broadcaster based in Gabon (in French). Gabon related news by the UN news agency. A people of hunters and gatherers, Baka Pygmies live in the rain forest of Cameroon, Gabon and Congo. Gabon is ranked as an upper-middle-income country. As the fifth largest oil producer in Africa, Gabon has experienced strong economic growth over the past decade, driven in particular by its oil and manganese production. Central Bank of Cameroon, Chad, Central African Republic, Congo, Equatorial Guinea and Gabon. Gabonese Bank of Development at Libreville. Discover Gabon: Estuaire, Haut-Ogooué, Moyen-Ogooué, Ngounié, Nyanga, Ogooué-Ivindo, Ogooué-Lolo, Ogooué-Maritime, Woleu-Ntem. Gabon information and promotion site. About the National Parks of Akanda, Monts Birougou, Ivindo, Loango, Mayumba, Monts de Cristal and more. Information on the Park of Lékédi near Bakoumba, a small provincial town of Haut-Ogooué province in the south-east of Gabon. Gabonese community website for the exchange of ideas for citizens, friends and travellers of Gabon. Located in the Petit Loango National Park in Gabon. An autonomous state institution and the national university, Libreville (no website). Profile of higher education practice in Gabon by International Network for Higher Education in Africa. Conservation and development of the Forest Ecosystems of Central Africa, the European Union's commitment to a sustainable exploitation of natural resources. Gabon National Parks - 10% of the Gabon's area is set aside for gorillas, elephants and chimps. Page with information about Langoué Bai, one of the five most important forest clearings in Africa. Information about field work of the society in Gabon. Gabon's history; Wikipedia encyclopedia entry. Including economic overviews and directories of companies.